You might believe all dog leashes are created equal but there are some on the market that can cause serious harm to you and your pet —namely, retractable leashes. Below, we'll go through some of the dangers that are associated with these types of leashes and why your dog will be happier and safer without them. As the name suggests, a retractable leash is comprised primarily of a thin, coiled rope that retracts through the use of a small button on top of the plastic casing that doubles as a comfortable handle for the walker. Unfortunately, the casing for these leashes is often opaque so you cannot check the wear and tear on the device or the cord and have no way of knowing if it needs replacing. This can lead to a dangerous situation if your dog yanks on the leash and the thin cord snaps, thus leaving you with no control of the situation or your dog as he barrels toward whatever has caught his interest. These leashes allow your dog to venture far away from you, much further than regular leashes permit. This can present a series of problems, one of which being that your dog can easily ignore commands and proper walking etiquette if the leash is not locked into place. If your dog does not need to obey the rules some of the time, he may start testing them all of the time. This can lead to pulling, yanking, and the deliberate ignoring of your commands unless you force him to heed through pulling him back by the leash. Dogs thrive on structure and retractable leashes provide very little of that. It's important for your dog to understand that being on a walk does not mean he has free roam. He should also understand that there is a time and place for fun, games, and chase. It's harder to enforce these rules on a retractable leash especially if your dog has a high prey drive. If your dog is chasing everything from cars to critters, check out this link that will teach you How to Tame Prey Drive in Dogs and Stop the Chase. An excitable dog with a loose retractable leash can be quickly clotheslined if the owner suddenly yanks on the leash or locks it to prevent the dog from entering into dangerous territory like a busy street or a hazardous ledge. This can be exceptionally bad if the dog is wearing a collar and not a harness. At that point, the owner is putting direct pressure on the dog's throat and trachea. This should be a concern for all dogs but especially those who may be prone to tracheal collapse. Retractable leashes can also be hazardous to a dog's health due to how easily a dog can become entangled by the device. Often, when a dog becomes ensnared, its first reaction is to scramble and struggle for freedom. This can often cause more entanglement and injury as the dog's limbs are pinched, marked, and even lacerated by struggling against such a thin cord. Dogs are not the only ones likely to suffer when the handling of retractable leashes goes awry. These leashes can cause blindness as in the case of Dereka Williams, who was hit in the eye by the metal clasp when her dog's leash broke on a walk. But blindness isn't all you have to worry about. There have been reports of facial lacerations, broken teeth, and even fractured collarbones occurring when retractable leashes malfunction. 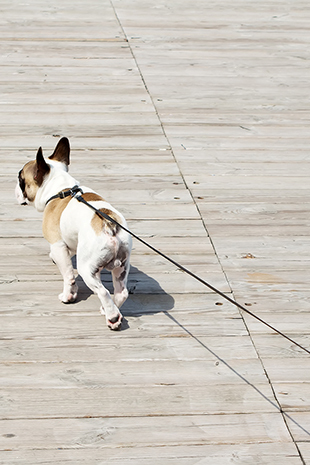 While the use of a retractable leash might seem like a good idea, it poses a great risk to owner and dog alike even when used with great care. Due to this, it's easy to see why regular leashes are preferable. Regular leashes, despite their lack of extended length and "freedom," will be able to provide you with the safety and structure needed for you to have a pleasant walk with your best friend.